I've been thinking lately about that word. I tend to use it so flippantly. "Oh, God's grace is so good." "We must have grace for one another." One of my sons asked his grandmother this question, and she answered with no hesitation. "Ah, grace.... it means undeserved kindness." I know that is not the only definition, but I like this one because it's so simple and yet so profound. It's easy to plug into all those sentences I've been tossing around. Oh, God's undeserved kindness is so good. We're saved by His undeserved kindness. We must have undeserved kindness for one another. It's helping me digest the verse God dropped in my heart when I was praying about my boys and how to deal with them. But what does God mean when He asks me to speak to people with grace and salt? What's the practical application when just about 'every person' I encounter in a day is less than four feet tall, looks kinda like me, and has the attitude of a rhinoceros? I plugged in my mom's definition of grace, and it suddenly made perfect sense. I don't claim to know how to exegete scripture, and it's not an official translation, but it's laymans terms that I can understand. So I wrote it on our kitchen chalkboard; for my boys, yes, but mostly for me. Because I want to take hold of that, to really let it sink in and change me, to see the fruit it will bring in our home. I want to speak to them with undeserved kindness, to always bring out the best in them with my words and to speak life, because that is what He does for me. Love this post. What a great way to try to wrap your head around what God does for us and what we should do for others. Thanks for sharing. Going to look up that verse right now...it is going on our white board in the kitchen too! Kira - this is great! I've never thought of subsituting the definition for the actual word before. It really brings it to a level that's more tactile. This verse is going on our board at home too! I LOVE this. I have always struggled with the meaning of the word grace. I don't really know why. But you really got me with "undeserved kindness". Really put it into perspective for me. Awesome verse too. Ive heard it before but by substituting the words it really hit home. Thanks for this. Needed it today, kira! Your words are like balm to my weary spirit. I needed this so badly today. Thank you! yes. Yes. YES!! Thank you! That's how my brain works too... I'm going to write this on our chalkboard too... as soon as I make it. Need to remember. THANK YOU! 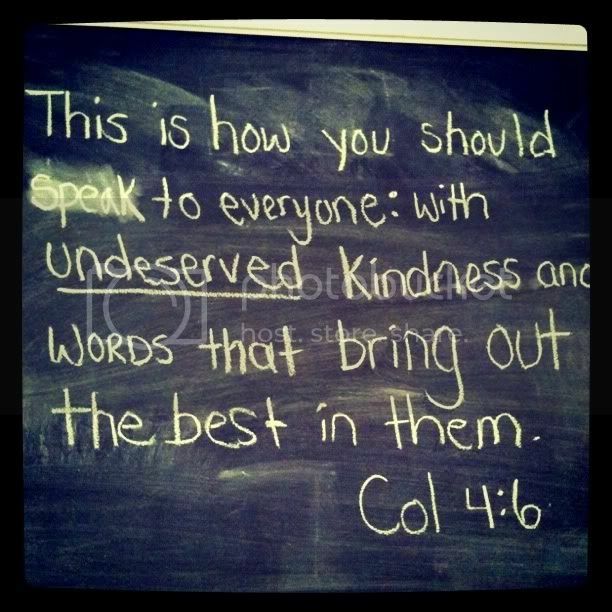 LOVE the definition of 'undeserved kindness'. LOVE how your mum said it so effortlessly. LOVE how you got an epiphany. LOVE how you are then sharing it with all us. I don't remember how I stumbled over to your blog, but I've been reading it for a while now, and I love your posts, especially your Fridays. :) Your family sounds adorable, and you make me crack up!